Jorinde Voigt creates drawings using a series of algorithms that enable her to methodically fill paper with sweeping arcs, arrows and lines. 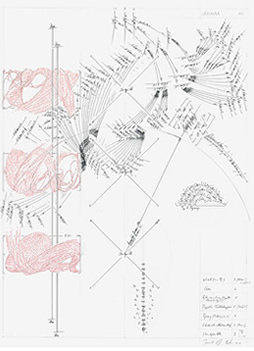 Although her works are essentially self-generating, they nevertheless resonate with a surprising emotional depth achieved through selective juxtaposition of algorithmic sequences - all of which are devised by the artist and given names such as Zwei küssen sich (Couple kissing) - along with textual annotations and hand-drawn, slightly quavering lines that resist absolute mathematical perfection. Compelling and complex, Voigt's increasingly acclaimed drawing inhabits a space in which the mechanical evokes the emotive. As Voigt herself has said: "My work is like music. You can enjoy it without being able to read the score."